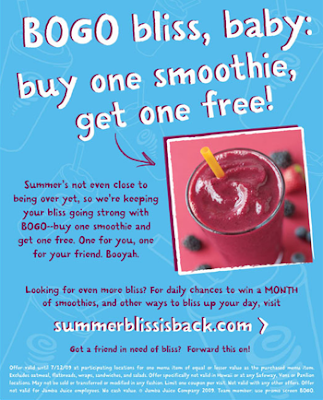 New promotions at Jamba Juice just in time for your summer! For a limited time... looks like another 2 weeks, you can pick up a FREE Jamba Juice smoothie with the purchase of a smoothie. Perfect date for sweet hearts (pun intended). Be sure to tell your friends about this one. We all need some extra sugar, juice and ice in our lives. Word! ;) Thanks and Enjoy!